So, what does this species do? What are its behaviours? Where does it live? I started digging around to see what literature exist on this species. There are certainly many publications that discuss its distribution – it is on many checklists (see here for a relatively complete list), and I was aware that it was originally described as Synemosyna picata (by Hentz, in 1846). Peckhamia picata is a widespread species, with an incredible appearance, and it’s a jumping spider! Salticids are the darling of the arthropod world –> the panda bears of the invertebrates: big eyes, furry, fascinating courtship behaviours, and truckloads of ‘personality’. Surely we know SOMETHING about what I declared as my favourite species. Thankfully, in a filing cabinet in my laboratory, I have a series of older publications on the Salticidae, including “A Revision of the Attidae of North America” by Peckham & Peckham (1909) [available here as a PDF download – note: big file!]. 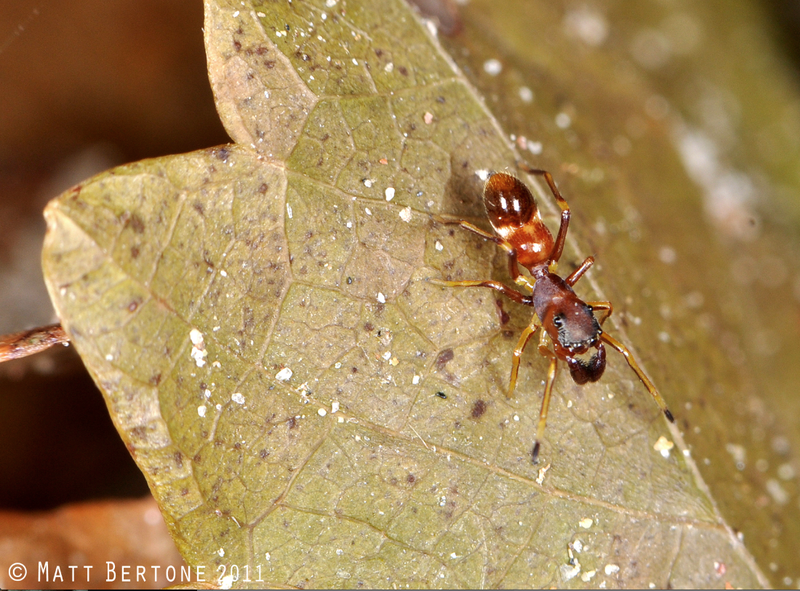 The George and Elizabeth Peckham did an incredible amount of work on the Salticidae (called Attidae, previously). 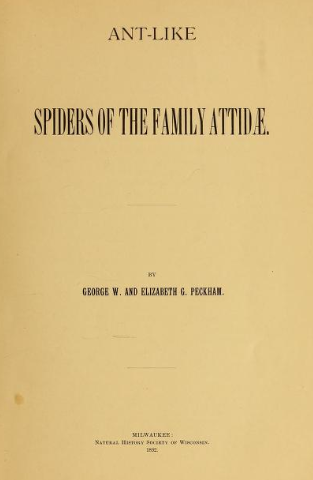 The Peckhams are themselves a fascinating story – some details are on their Wikipedia page and I’ll summarize briefly: they were teachers (in Wisconsin), natural historians, behavioural ecologists and taxonomists, notably with jumping spiders. The bulk of their work was done in the late 1800s, and they often cited and discussed Darwinian concepts. They were awesome and I would have liked to meet them. 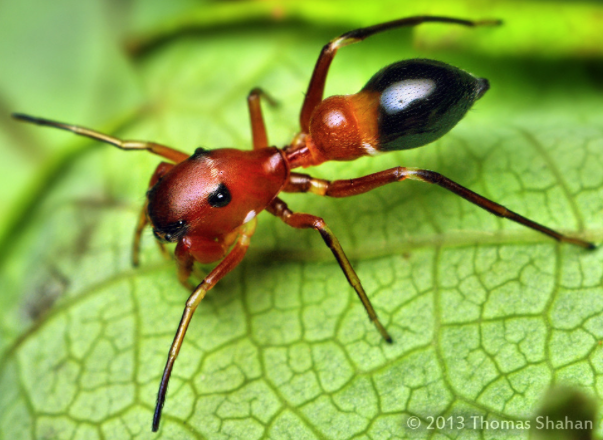 Another stunning Peckhamia species, this one from Thomas Shahan. So, back to Peckamia picata: Their 1909 tome states the following about the species “We have described in detail its mating and general habits in Vol. II, Part 1 of the Occ. Pap. Nat. Hist. Soc. Wis. pp. 4-7)”. So, apparently 1909 does not take us far enough back in history to learn about Peckhamia picata. Their paper from 1892 had all the details, and thankfully was fully accessible on the biodiversity heritage library. From the Peckham’s 1892 publication. In sum, this journey of discovery has made me fall in love with Peckhamia picata even more. It’s also reminded me that OLD literature is essential to our current understanding of the species we identify. There is a wealth of information in these “natural history” papers – although the writing is in a different style, it is scientific, it is the foundation of current biodiversity science. We cannot ignore these older books and “Occasional papers”. We can’t rely on quick internet searches and we certainly can’t rely on literature indexed on Web of Science. We must dig deep and far into the past. There are ‘treasure-troves’ aplenty. *The oldest paper cited in Durkee et al. is from 1960. They did not cite the Peckhams. Peckham, G.W., and E.G. Peckham. 1892. Ant like spiders of the family Attidae Occ. Pap. Nat. Hist. Soc. Wis. II, 1 . Peckham, G.W., and E.G. Peckham. 1909. Revision of the Attidae of North America. Trans. Wis. Academy of Sci., Arts & Letters. Vol. XVI, 1(5), 355-646. ← Undergraduate students tweet their research questions. Great post Chris! Love it when history can be brought in to a post to enlighten us. Good points about the old literature! I find quite a bit of useful and informative stuff in BHL (for example: http://wp.me/p2SUYU-Af). Whenever I investigate I species more thoroughly, it is one of the first places I turn. Thanks Sean – I WISH I always remembered to go to the old literature -I get so caught up in ‘what’s new’ that I forget that ‘old’ informs the ‘new’. The BHL is an incredible resource. I’m a big fan of the older style of writing – scientific but also eloquent and engaging. I understand the reasons why it has evolved into today’s dry, factual, minimalist style, but perhaps as literature becomes more prelavent electronically and less so in print at least one of the roadblocks to a return to eloquence can be removed. Thanks Ted, for the comment. Quite a few years ago I did an assignment with students in an Entomology class in which they were given a passage from an old (pre 1900) publication about an insect, and they were required to ‘make it be like it was from the 2000s’. It was a fascinating exercise, especially because it exposed us all to the beauty of that ‘engaging style’, as you mention. It would be nice to see a return to eloquence!! An interesting twist on that assignment would be to give them a modern passage and have them ‘convert’ to the historical style. Indeed, this is fantastic. And particularly interesting in terms of our earlier discussion on Twitter. I’ve been reading Wallace’s “Malay Archipelago” for awhile now. It’s like a case of fine wine, actually. Once a week or so I pop the cork off of the next chapter and read through it. I think it should be required reading for all biology undergrads, actually. Awesome. Good idea re: req’d reading (see my comment to Ted, above). Oh, and it probably goes pretty well with a glass of wine, too! Cool idea for an assignment. Wine… indeed! Wallace would approve, I’m sure. Very nice article. The Peckhams made great descriptions. 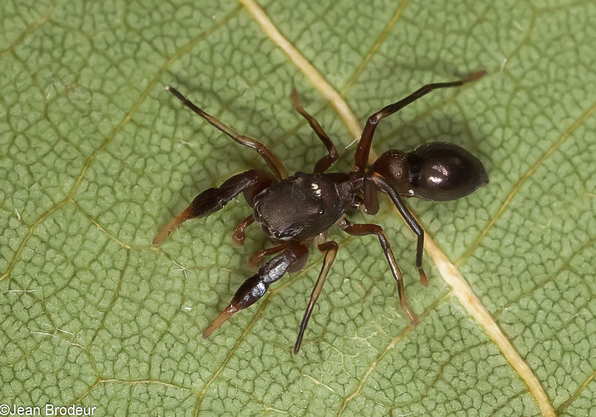 I have only come across one ant-mimicking jumping spider before (well one that I recognized at the time), but it also displayed the frantic, seemingly random movement of an ant. Just another reason to love a jumper. Ah yes, the movements are SO peculiar for a jumper – the fascination about these arachnids, for me, is seemingly endless! An excellent read, and salient point. I’ve got quite a few older books on my shelf that I don’t delve into enough. Thanks for the info and excellent pics. I must admit I am rather fond of jumpers..